I recently had the opportunity to grade a couple of short and long form pieces in the relatively new ACES color space. While not widely accepted just yet, I feel as though it is only a matter of time before it becomes part of the normal workflow for movies and commercials (especially if they’re VFX heavy). Whether or not that is a good thing for colorists is still up in the air. 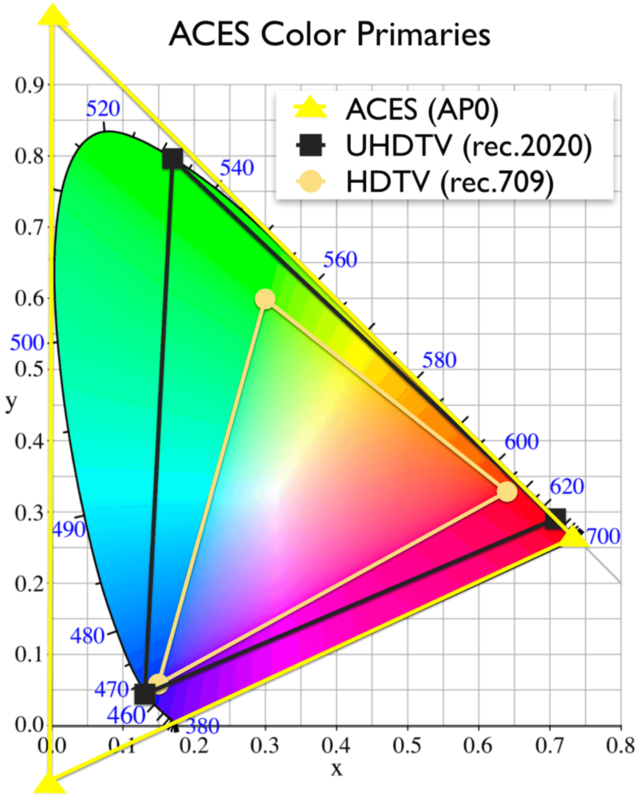 ACES, simply put, showcases a huge range of colors that allow for every aspect of post production to work on the same playing field while eliminating room for error when passing footage back and forth through the finishing process. It also serves as a method of future proofing, since it maintains color data that is not visible with today’s technology. As monitoring gets better, we’ll have the ability to remaster footage from it’s raw source without any quality loss. In the chart below, you can easily see how much more information is available than rec709 or rec2020 (or visible light for that matter). The basis of ACES is pretty simple. You’re basically reverse engineering the camera data to bring it to a common starting ground (scene referred). Each camera manufacturer provides an IDT (input device transform) that takes out the “special sauce” of the camera and brings the footage back to scene referred. Obviously you need to know how the footage was shot in order to make this happen. Think Slog2 or LogC. As long as your project is set up properly the footage should take on a whole new feel. The controls are much more sensitive and feel a little different than they normally do. The Academy (the driving force behind ACES) swears that there is no “ACES look”, but in my experience, there definitely seems to be a little bit of a unique feel to it. Almost as though I was encountering some limitations as I dove deeper into the grade. It felt like certain boundaries were being reached when being pushed to the extreme. Once you have your project properly set up and your IDT chosen, you need to select your ODT (output device transform). This is what color space you’re monitoring in. For me, it’s rec709. For some it might be p3. It all depends on your setup. I’m really simplifying this, there is a lot that goes on behind the curtain that makes this work properly. I’m not going to get into it all, but it’s definitely worth learning. Robbie Carman at Mixing Light does an awesome ACES breakdown that I highly recommend. So now you can go ahead and grade as normal with the IDT and ODT applied to the footage. There really shouldn’t be anything different except for how the controls feel. It takes a little getting used to it, but after a couple times you get the hang of it. If you’re passing any footage off to VFX for finishing it’s critical that you’re both working in the same color space. As long as the finishing artist knows the IDT for the particular camera they can apply that setting and work with whatever ODT fits their setup. You instantly have a common starting ground that eliminates all confusion when handing clips back and forth between systems. Nothing is burned in. No more getting files from VFX and applying your grade only to have the image look completely wrong. For VFX handoffs, it’s a really great form of standardization. In my opinion, it’s only a matter of time before ACES becomes the norm. With VFX getting bigger and better with every passing moment, it makes sense to streamline the workflow as much as possible. I imagine studios will really be pushing this as a way to standardize their workflow. It’s the standardization aspect of ACES that makes me a bit hesitant to accept it. So much of what we do as colorists involves a certain sense of uniqueness to it. I’m just not sure if I’m sold yet. This could be a big step towards making everyone’s lives easier while eliminating a lot of headaches and frustration along the way. Hi Rob, thanks for the post! I’ve been trying to work with ACES for a little while but I’ve been wondering how to handle a project that’s been shot with multiple different cameras? It looks like I can only use one IDT at a time. Thanks for reading! Instead of setting the IDT in the Color Management section of the Project Settings, right click on a file in the media pool and select the proper ACES Input Transform. Really interesting read. Mixing Light is getting a new subscriber out of this. The easy part for me starts at the end. Set my ODT to REC709. Done. It’s the start that is the main issue. IDT does not list the cameras used on the films that I color restore. Understandable, since the films and cameras used are at least more than 60 years old. LGG felt a little strange at first, but with experimentation I have been getting some quite nice results. Color and detail that otherwise is missing. ACEScc makes it a feel a little more recognizable, but, I agree that the controls felt a little weird at first. Super sensitive. But after a bit, I got the hang of it. For me the big question is if we’re undoing the cameras “secret sauce” to get to a common starting ground, is everything going to look too similar? There is an inherent uniqueness in each camera technology that aids in look creation. That is the very reason why directors and DPs choose to shoot with a particular camera instead of just saying “ehh, I don’t care, I guess we’ll just use that camera”. Will ACES negate that? I hope not.